Most of us, of a certain age that is, are familiar with record players. Growing up in the 1970s, I enjoyed a series of them; each, upon breaking, being gradually replaced with higher quality and more sophisticated versions. The origins of those record players were the victrolas, made possible by the inventiveness of a native son of Delaware, Eldridge Reeves Johnson, who founded the Victor Talking Machine Company and was a pioneer in the sound-recording industry. The Johnson Victrola Museum highlights the life and achievements of this businessman, innovator, philanthropist and progressive employer; exhibits include phonographs, recordings, memorabilia, trademarks, objects, and paintings that highlight Mr. Johnson's successful business enterprises and chronicle the development of the sound-recording industry. Ironically, this genius inventor was not considered smart enough to go to college. Instead, he was encouraged to learn a trade. Johnson went on to become a machinist, working in Camden, New Jersey. Eventually, Emile Berliner, inventor of the gramophone and disc record, approached him, asking him to turn his talents to inventing a motor that would play discs at a continuous speed, eliminating the need to constantly crank a gramophone by hand. Johnson's spring motor invention was a success. By 1901, Johnson founded the Victor Talking Machine Company. The company grew to encompass 10 city blocks in Camden, grossed millions annually, and produced some of the most famous recording artists in the world. Johnson's invention led to development of Victrolas, the iconic box with a huge horn coming out. The museum details other innovations -- early ways to control the volume, and so forth. Some of the Victrolas were quite ornate! If you visit the museum, you'll also learn the origins of the phrases -- still used today -- of put a lid on it and put a sock in it! Victrola is indelibly linked to the iconic image of a dog, with his head cocked, staring intently into a Victrola. The dog's name was Nipper and he was a mutt -- probably a bull terrier/fox terrier. Almost everyone I know -- of a certain age that is -- recognize the image of the dog intently staring into and listening to the phonograph. The image was still on records produced by RCA, which had by then bought the rights to the image, up until the 1970s. Nipper was a real dog who lived in England whose hobbies were chasing rats, and listening to music. 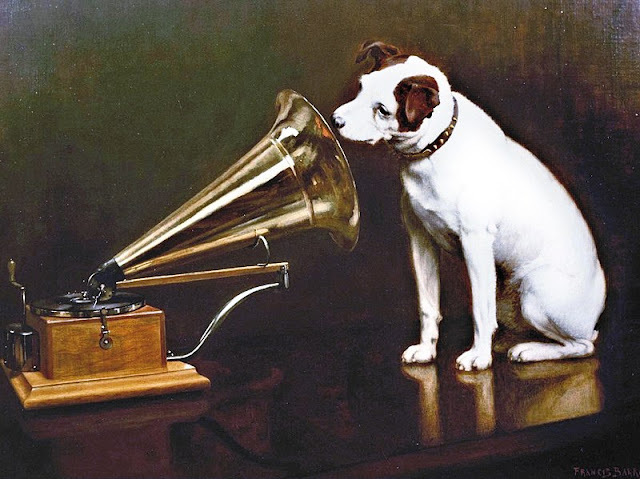 Artist Francis Barraud apparently saw the dog listening to music, and thought it would make a great painting; he painted Nipper listening to "His Master's Voice" in 1899. Nipper salt and pepper shakers. Berliner, a genius in his own right, purchased the painting and copyright for use as the trademark for The Gramophone Company in London. The original painting featured Nipper listening to a cylinder phonograph but Berliner insisted it be changed to a Berliner Disc Gramophone as a condition of the purchase. E.R. Johnson acquired the U.S. rights to the painting from Emile Berliner in 1901, leading to a merger with The Berliner Gramophone Company to form The Victor Talking Machine Company. Johnson, an astute businessman, launched Nipper's image and company name to world-wide fame by branding everything from Victrolas and recordings to salt and pepper shakers. You learn all this at the museum, as well as see (and hear) still-working Victrolas and gramaphones. You see what a Victrola store would have looked like in the early 1900s, and learn about the life and achievements of Johnson, who is an American genius. One of the coolest things is that Johnson was well ahead of his time. When a fire broke out at a neighboring factory, he installed fire alarms in his factories. He also brought in child care for working mothers, right onsite of his factories. The second floor of the museum, the Heiges Gallery, offers an extensive collection of artifacts from the Victrola industry, including an comprehensive collection of Nipper statues. Hours: Wednesday-Saturday 9 a.m. - 4:30 p.m. and most holidays; closed Thanksgiving Day, Christmas Day, New Year's Day and Easter.